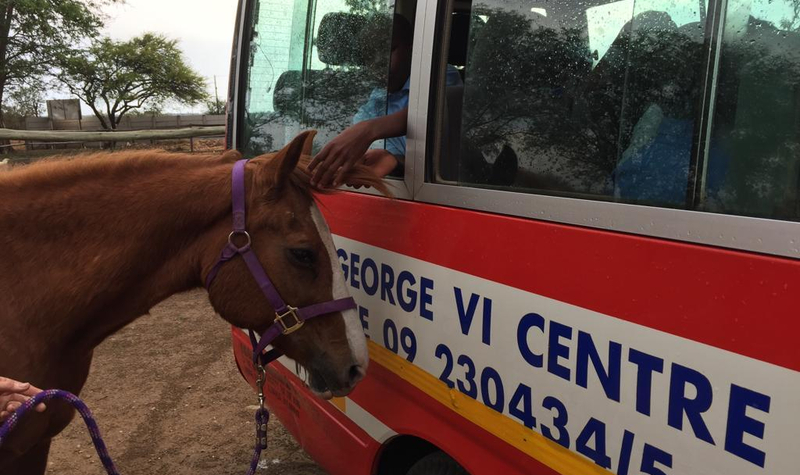 What a great year 2018 has been for therapeutic riding with KGVI! We are honoured to have been partnering with KGVI for 5 years now, and it has been a wonderful partnership. When we think back to our first session, we have all come so far, learnt so much together, and benefited hugely from our association with each other. Before we took our first step together, it took a lot of sweet talking on our behalf to win over the physio staff of KGVI, to persuade them to to put their precious children on the backs of these enormous animals! Literally ten minutes into the first session, the therapists were sold on this new concept, and we haven’t looked back since. After all, what’s not to like in Equine Assisted Therapy? The children are outside, they are not shut inside being asked to do repetitive exercises which are often painful, they are sitting on the backs of these magnificent animals, having the time of their lives, not even conscious of the movement and exercise strengthening every muscle in their bodies. Before they know it, they are moving in ways they have never moved before, accomplishing tasks their families never dreamed they were capable of accomplishing, feeling alive, important, and integrated in the community. We are the amazingly lucky people who get to witness these moments in these childrens’ lives, to watch the ponies change lives on a daily basis. Not only are these children slowly learning to ride a horse, but their lives at home and school are enhanced by the new skills learned and abilities conquered. On the last day with KGVI for 2018, it rained! No one in Zimbabwe is going to complain about rain, so we pretended it wasn’t there, and KGVI, even though there is a fuel shortage, and using fuel unnecessarily can mean spending hours in a fuel queue, came all the way out to the stables. So, after playing on the bus for while, we decided that the older kids could come and ride, while the younger ones stayed warm on the bus. We were lucky enough to have a visit from the Young Leader’s Society from Christian Brothers College in Bulawayo, Jordan Smith, Wade Pettican, Aarish Naik and Stavros Kehayias, nice strong boys to side walk with us, it was really nice to meet you guys. Although we thought this would just be an orientation for you, you ended up side walking anyway, and it was great to have your help, we hope you will continue to volunteer with us here at Healing with Horses. We were so grateful to these boys, who not only lent us their muscles, but also brought donations for the grooms, who work so hard for the KGVI sessions as well as for the other sessions we do, St Francis, Ingutsheni, Zimcare, Sandra Jones, Harvest Family, and all the individuals we serve on a daily basis, as well as taking care of the horses. Thank you so much boys for these generous gifts. When the children can’t come out to the animals, the animals go in to the children! We also had very important visitors on this last day, Ambassador Bronte Moules from the Australian Embassy in Harare, and Amanda. The Australian Embassy donated an irrigation system to us through their DAP program, and this has enabled us to grow pastures and fodder crops to reduce our feed costs. We are extremely grateful to the Embassy, and love to have a visit from them, especially as they are so kind and take us as we come, which is usually chaotically busy in the middle of a session, they are always so gracious in the midst of our chaos, and this afternoon was no exception! All the animals appeared to think it was acceptable to join the children on the bus, as they weren’t coming out to them. So we had Daisy, Echo and Kira, the dogs, and Lucy the goat on the bus, and although she tried very hard to join them, we drew the line at allowing Twinkle the donkey to do so as well! We had our sweet Spha, one of the kids from KGVI, sobbing inconsolably on the floor of the bus because it was too cold for him to come out and ride, and so we had to bring Waterford Freshly Ground, one of our cremellos, for a visit to the bus as well, and after seeing this beautiful head descending to comfort him, Spha was all smiles through his tears, and agreed to stay on the bus today. And so the last session of the year ended. Thank you to KGVI, kids, staff, our volunteers, grooms and of course, ponies, for sharing the year with us, and keeping our hearts whole. We hope that you all have an amazing Christmas and New Year, and that 2019 brings peace, fuel, and love to Zimbabwe! Please, volunteers, remember that our other groups continue through the holidays, so if you find yourself missing the kids and the ponies, get hold of us and come and help with the other groups. We need helpers every day of the week except Sundays, and even on Sundays you can come feed and brush the ponies and tidy up around the yard if you would like to! We are so grateful to each and every one of you for your hours of hard work, and the loan of your muscles and hearts throughout the year. Stay safe!